Read the Medication Guide provided by your pharmacist before you start taking phenytoin and each time you get a refill. If you have any questions, ask your doctor or pharmacist. The tablets may be chewed thoroughly before swallowing or swallowed whole. What conditions does Dilantin Infatabs 50 Mg Chewable Tablet treat? List Dilantin Infatabs 50 Mg Chewable Tablet side effects by likelihood and severity. What should I know regarding pregnancy, nursing and administering Dilantin Infatabs 50 Mg Chewable Tablet to children or the elderly? Does Dilantin Infatabs 50 Mg Chewable Tablet interact with other medications? Should I avoid certain foods while taking Dilantin Infatabs 50 Mg Chewable Tablet? Do not change from one brand of this product to another, or to another dose form of this drug (e.g., capsules) without consulting your doctor or pharmacist. Your dosage may have to be adjusted. 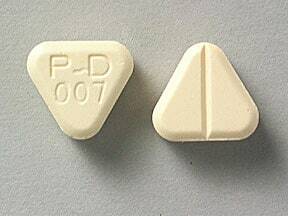 This medicine is a yellow, triangular, scored, chewable tablet imprinted with "P-D 007". Are you taking Dilantin Infatabs 50 Mg Chewable Tablet? Are you considering switching to Dilantin Infatabs 50 Mg Chewable Tablet? How long have you been taking Dilantin Infatabs 50 Mg Chewable Tablet? Seizure Success: Are Your Meds Really Working?